More than any other site in Japan’s capital, Tokyo’s Senso-ji temple seems tuned into the pulse of Japan’s religious heartbeat. The flurry of activity that surrounds this temple at all times of the year underscores its significance — even today, sumo wrestlers come here to pay their respects before the big annual tournaments, impelled by hopes of defeating their opponents and becoming champions. While Senso-ji is located in a major sightseeing area, there are still a few hidden spots that even the most seasoned Tokyo travelers have yet to scope out. This is a complete guide to the history and attractions of one of Japan’s most famous temples. Senso-ji is Tokyo’s oldest and most important Buddhist temple. It’s a requisite stop on any Japan itinerary, especially if you don’t plan on visiting a temple-heavy destination like Kyoto. The origin story of Senso-ji heavily involves Kannon, Buddhist goddess of compassion. In the year 628, two fishermen brothers discovered a statue of the goddess in the nearby Sumida river. Not knowing what it was, they immediately discarded the image, throwing Kannon back into the river. Shortly after, however, the goddess appeared again in their fishing nets. No matter how many times the two brothers threw it back, the mysterious figure would reappear. Finally, they carried the image to the head of the village, who identified the persistent statue as the goddess of compassion. Senso-ji grew around the worship of this image of Kannon. Today no one has any idea as to where this statue is — the legend continues to divulge that 17 years later, a Buddhist priest hid the image from public sight somewhere in the temple. Other say that Kannon lies buried somewhere beneath the temple grounds. Visitors approach Senso-ji temple through Kaminari-mon, or Thunder Gate. With its gigantic red-paper lantern, this is the main entrance to the temple complex. Thunder Gate has lived many lives since its initial construction in the year 941. Fires destroyed the gate at least five times between 941 and the late 1880s, and air raids wiped out Kaminari-mon once again during World War II. At almost 40 feet tall and 40 feet wide, the present-day Kaminari-mon is a post-war reconstruction that was largely funded by the founder of Panasonic. Its intimidating lantern measures about 13 feet tall by 11 feet wide, and weighs approximately 1500 pounds. Guarding the temple from evil spirits are two wrathful deities that stand inside tall, fenced alcoves. The eponymous Thunder God is on the left, and the Wind God is enclosed on the right. Before reaching Senso-ji’s main hall, you’ll pass through Nakamise-dori, an area packed with food stalls and stores. Behind the last block of shops, there’s Denbo-in — a smaller Buddhist temple with a secret garden. Once reserved exclusively for the temple’s abbot and Japanese nobility, today the garden is open to the general public. Unbeknownst to most tourists, this quiet enclave is an ideal place to escape the midday crowds. Denbo-in welcomes outside visitors in the spring, between March and May. Hozomon, or Treasure House Gate, marks the entrance to Senso-ji’s inner area with three large lanterns. The gate houses sutras (Buddhist texts) and other treasures. There are two fearsome guardian gods here as well, and an enormous pair of traditional sandals that hang on the back wall. As you move through Hozomon, you’ll see a huge bronze incense burner in front of Senso-ji’s Main Hall. Visitors actively fan the wafting incense smoke toward their bodies, as a kind of protective talisman against illness and other misfortunes. The Main Hall is where people offer their prayers, and it’s a good idea to have some loose change to toss into the offering box. Before leaving the inner grounds, make sure to admire the looming five-story pagoda to your right. Nakamise-dori is the area leading up to the Main Hall. There are over 80 stalls here, selling a vibrant array of souvenirs and snacks. For friends back home, pick up a few maneki-neko figurines — those beckoning cats that welcome customers at nearly every commercial establishment in Japan. This is a great place to try some local street food, including baked senbei crackers and imo yokan, tempting balls of sweet potato jelly. One of Senso-ji’s signature street foods is ningyo yaki, small sponge cakes filled with red bean paste. Among these cakes are tiny replicas of some of Senso-ji’s signature sights, like the giant lantern at Kaminari-mon. This area also sells another signature treat called kaminari okoshi, or “thunder crackers.” These oddly satisfying puffed rice crackers are made of rice, millet, sugar, and beans, and available fresh or prepackaged. Most shops at Nakamise-dori are open until 5 p.m., and it’s best to get there mid-morning, before the afternoon tour groups. Senso-ji hosts many exciting festivals throughout the year, including Tokyo’s biggest and most raucous cultural event, the Sanja Matsuri. Over the third weekend in May, dozens of portable Shinto shrines are carried from the temple through the nearby streets. Senso-ji is at its most festive, teeming with street food, games, and musical performances. Don’t miss the opening procession that features Buddhist monks, geisha, and dancers clad in traditional garb. If you’re visiting Tokyo in late August, you’re in luck. The annual Samba Festival, a hyper-vibrant event that celebrates Japan’s close ties with Brazil, takes place in the area immediately adjacent to Senso-ji. It’s quite a sight to see bedazzled samba dancers strutting in front of Kaminari-mon’s formidable gate. Around Christmas time Senso-ji hosts a market that exclusively sells hagoita, decorative wooden paddles. These were originally used to play a Japanese game not unlike badminton. They are now used as lucky amulets and toys. Tucked into the northeastern districts of Tokyo, Senso-ji is located in Asakusa, a few subway stops from the National Museum in Ueno and the sensorily-challenging anime paradise of Akihabara. 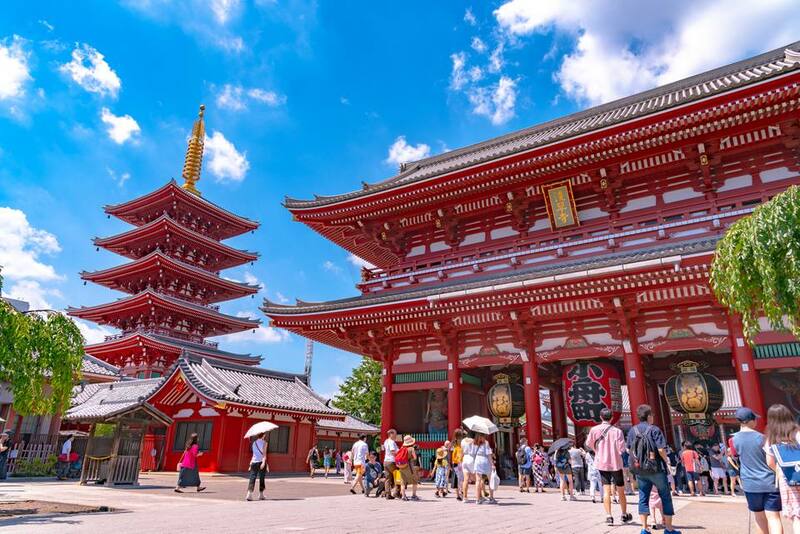 To get yourself oriented, sign up for the free walking tour that takes you through Senso-ji and the Asakusa neighborhood. The entire area is quite pedestrian-friendly, and dotted with some amazing restaurants, including Unagi Sansho, an eatery famous for its eel on rice. If you’re not eager to eat a small box of roasted eel, try restaurant Aoi Marushin, a cozy spot for sashimi and tempura. If you’re traveling on a budget, there’s the incredible Nui, a stylish new hostel located in Kuramae, a hip neighborhood very close to Asakusa. But if you’ve got some cash to spare, book a room at the four-star Asakusa View Hotel. The hotel lives up to its name — this is where you can experience the most stunning vistas of Asakusa and beyond. Revel in the bird eye’s view of Senso-ji temple as you retire after a day of rigorous sightseeing.